Need help with a hacked website? As the highest customer-rated website security company in North America, I do a lot more than just remove malware. Website “malware removal” is only 10% of what I do in securing your hacked website. 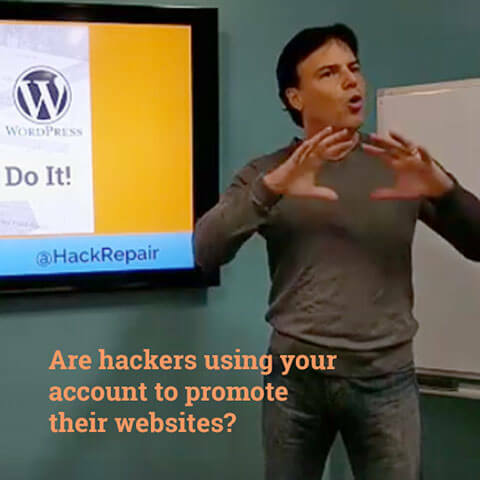 My goal is to fully secure your hacked website and help you prevent your website from being hacked again. If you Google me, Jim Walker The Hack Repair Guy, you’ll find pages of links where I have helped people whose websites have been hacked. I love fixing hacked websites. Concerned about WordPress security and would like someone to watch your back? If this sounds like you then you are in the right place. Taking a vacation, or maybe your web designer has wandered away? Why worry about the dark side of the Internet. Let The Hack Repair Guy worry for you.